Is your favorite color pink? Here’s the perfect container for your deck or patio filled with long-lasting color. It’s easy to care for, too! Use soilless potting mix, not garden soil in the container. Water when you insert your finger into the potting mix up to the knuckle and it's dry. Feed monthly with a water-soluble plant food at full strength. Give it afternoon shade to help flowers last longer. Don't worry about deadheading any of these plants. 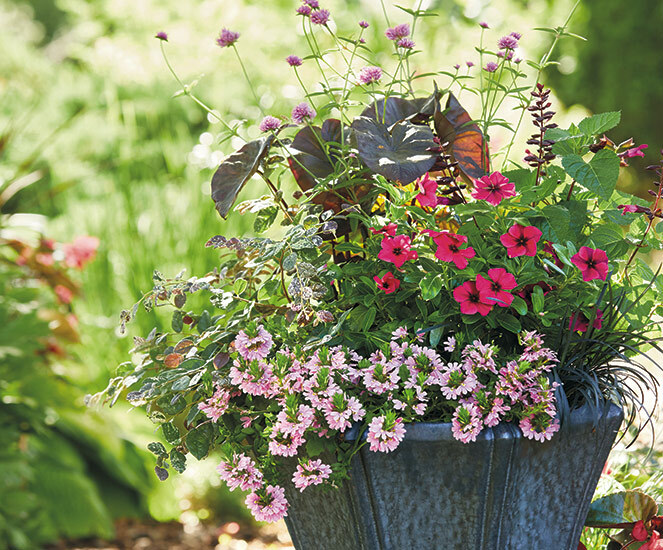 When it comes to growing beautiful containers, it all starts with the best container plants. Meet 8 of our favorites for colorful, easy-care containers all season. Getting this look in early spring is easy — many garden centers offer blooming plants you can combine to create beautiful combos now! Add some green to your home with a thoughtfully-made terrarium. Read on for all you need to know to create the dreamiest indoor garden.